Miriam's Cup The Kiddish Cups here for Passover would also work for Shabbat or Havdallah. About 3 feet of something. Curling Ribbon, Wire, gymp whatever. I used wire this time. 1. Take wire a twist a loop. For ribbon make a loop. 2. Rows 1 String 6 clear beads on one wire. Take other wire and string back through the same beads. Pull until they are in a straight row. Repeat for row 2. 3. 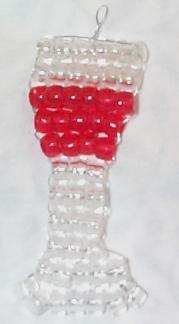 Row 3 String 6 Red beads. 6. Row 6 String 3 Clear beads. Repeat for Rows 7 to 9. 8. Row 11 String 7 Clear Beads. 9. Finish by tying or twisting. If wire string wire back through row 11 so both wires end up on same side. Then Twist. Cut extra and tuck in somewhere. Every so often when a picture is developed I notice that the beads I used were not all the same! Ignor the green beads in this picture. They were suppose to be all BLUE! 2 feet of wire or ribbon. 43 mini blue sparkle pony beads. 18 mini gold sparkle pony beads. Twist wire into loop or make a loop with ribbon. 1. Row 1 and 2 string 9 blue beads on one end then take other end and string back through the other direction. 3. String 8 blue beads. 4. Row 4 String 6 blue beads. 5. 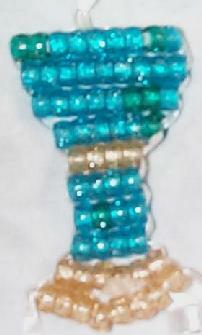 Row 5 string 4 gold beads. 6. Rows 6 to 8 String 4 blue beads. 9. Row 9 String 8 gold beads. String wire through a second time through row 9, so both end up on same side. Bend twist into design to hide. If ribbon just tie knots on both ribbon ends. Trim etc. 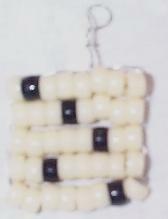 35 cream colored mini pony beads. String beads on one end of the wire. String back through with the other end of wire. Repeat for other rows. Row 1 String 1 cream, 1 black, 6 cream. 2. Row 2 String 4 cream, 1 black, 3 cream. 3. Row 3 String 5 cream, 1 black, 2 cream. 4. Row 4 String 5 cream, 1 black, 2 cream. 5. String 6 cream, 1 black, 1 cream. 1 1/2 feet of ribbon. 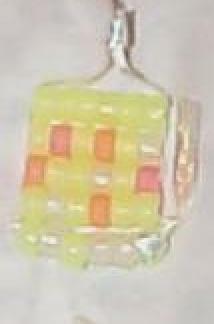 26 glow in the dark yellow mini pony beads. 5 orange glow in the dark mini pony beads. Make loop in the middle of the ribbon. 1. Row 1 string 6 yellow beads on one end and take the other end and string back through. Pull so it lays flat. Continue this way to end. 2. Row 2 String 1 yellow, 1 orange, 1 yellow, 1 orange, 2 yellows. 3. Row 3 String 1 orange, 4 yellows, 1 orange. 4. Row 4 String 3 yellow, 1 orange , 2 yellow. Row 5 String 6 yellow beads. Make knot on each end and cut off extra.